Principal research consultant of MMGC is Dr. Trudy Wassenaar, with expertise in the fields listed below. Our secretary Ms. Becker takes care of all administration (admin@mmgc.eu). In addition, partners with excellent knowledge on European patents, graphic design, and bioinformatics can be called upon when needed. With over 15 years of laboratory bench work there are few problems that the founder of MMGC can't solve. The main subject of her research was, and still is, Campylobacter jejuni, a human pathogen causing diarrhea. But she has also worked, and/or is still working on E. coli, several genera of probiotic bacteria, Vibrio cholerae, Staphylococcus aureus, Mycobacterium, Burkholderia, and other species. A few projects dealt with virology and even computer viruses were once an interesting subject to do research on. Her List of Publications speaks for itself. 1998-present: Founder of MMGC and principal research consultant in academic and applied microbiological research. Research consulting is carried out by intensive Email contact, web conferencing and regular personal visits. 2015-2016: Part-time associate professor at ORLN, Oak Ridge, TN, USA. 2005-2009: Part-time associate professor at the Center for Biological Sequence Analysis, Danish Technical University (DTU), Lyngby, Denmark. International research experience: three-month research visits were spent at the University of Cape Town, South Africa; at the RMIT University in Melbourne, Australia; at the South-African National Bioinformatic Institute, Belleville, South Africa; and at ID-DLO in Lelystad, the Netherlands. 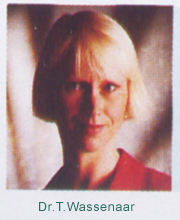 1993-1998: Research fellow at the Johannes Gutenberg University of Mainz (Germany), Institute for Medical Microbiology. Subjects of Research: heat shock and porin genes of Salmonella, hemolysin genes of E. coli and V. cholerae, and nearly all aspects of Campylobacter: molecular genetic characterization of virulence and colonization properties, genotyping methods, genetic instability, genomics, population genetics. 1989-1993: Ph.D., later Postdoctoral Fellow, University of Utrecht, Faculty of Veterinary Medicine, the Netherlands. Subject of Research: motility genes of Campylobacter jejuni. 1984-1989: Laboratory assistant at the Free University in Amsterdam, Department of Biochemistry, the Netherlands. Subject of Research: coordinated ribosomal protein biosynthesis in Saccharomyces cerevisiae. 1992: Ph.D. University of Utrecht, Faculty of Veterinary Medicine, the Netherlands. 1982: Qualified Laboratory Assistant in Biochemistry, with molecular biology as specialization, in Amsterdam, the Netherlands. She has acted as a referee for chapters in the following books: Environmental Microbiology and Ecology (Blackwell); Campylobacter, 2nd Edition (ASM Press). External examiner of Ph.D. theses from: RMIT University, Sydney, Australia; Utrecht University, The Netherlands; University of Cape Town, South Africa, Complutensa University of Madrid (UCM), Madrid, Spain. Member of the American Society for Microbiology, Deutsche Gesellschaft für Hygiene und Mikrobiologie, Society for General Microbiology, Society for Applied Microbiology. References from academic colleagues or one of our clients can be provided upon request. With over 15 years of laboratory bench work and over 15 years of consultancy experience there are few problems that the founder of MMGC can't solve. The number of bacterial species (pathogens as well as probiotics) that she has worked with is long - see her List of Publications.